On September 3, 1894, Benigno Aquino Sr. was born in Murcia, Tarlac to Servillano Aquino, a general in the Philippine Revolution who later served as a member of the Malolos Congress and, Guadalupe Quiambao, daughter of a well-to-do couple, Pablo and Lorenza Quiambao. After being taught the cartilla by a private tutor, the young Aquino studied under Bartolome Tablante in Angeles, Pampanga. Then he boarded at the school of Modesto Joaquin in Bacolor. In 1904, he entered the Colegio de San Juan de Letran as a boarding student. There, he reaped medals in oratory, and was the star pupil in the philosophy class. On March 8,1908, at age 13, he graduated from Letran with a Bachelor of Arts degree. Afterwards, he enrolled at the University of Santo Tomas to take up law. He completed his Bachelor of Laws degree in 1913 and, the following year, passed the bar. In May 1916, Aquino married Maria Urquico, the youngest daughter of a Capitan Antonio, a rich rice merchant in Tarlac who came from an affluent family in Bulacan. As one of the country's first certified public accountants in 1915, Maria worked as a bookkeeper for the family business at the time of the marriage. She and Benigno lived in a house near the Tarlac market where their first child, Antonio, was born. Three others followed: Servillano, Milagros, and Erlinda. In 1928, his wife, Maria, died of cancer. Two years later, he married his third cousin Aurora Aquino, who was 16 years his junior. They had seven children: Mauro, Benigno Jr. (Ninoy), Ditas, Lupita, Agapito, Paul and Tessie. Aquino served as representative of the second district of Tarlac (1919-1928), senator (1928-1934), and assemblyman (1935-1938). In 1938, after his stint in the legislature, he was appointed by President Quezon Secretary of Agriculture and Commerce and served until his resignation in 1941. During the Japanese occupation, Aquino was among the members of the puppet government of President Jose P. Laurel. 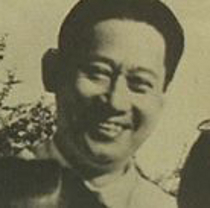 He was the secretary general of the KALIBAPI (Kapisanan ng Paglilingkod sa Bagong Pilipinas), a Filipino political party that served as the sole party of the state during the Japanese occupation. When the Japanese surrendered, he was arrested by the American military along with President Laurel and other prominent Filipino officials. In mid-September 1945, they joined the first prisoners of war to be sent to Tokyo's Sugamo Prison. It was in that concentration camp that Aquino developed a heart condition, and twice collapsed from a stroke. 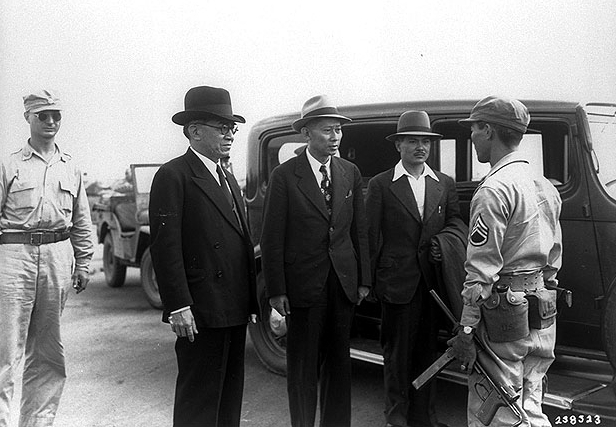 Laurel (second from left) being taken into U.S. custody at Osaka Airport in 1945, along with Benigno Aquino, Sr. (center) and Jose Laurel III (Photo credit: Wikipedia Commons). On August 25, 1946, after almost a year at the Sugamo, he was flown home by a US Army plane. He was very haggard, having lost about 30 pounds. Arraigned before the People’s Court, he entered a plea of innocence to the charge of treason and petitioned for bail. On September 11, 1946, he was released provisionally from prison. During the remainder of the year, he stayed in Concepcion and nursed himself back to health. By 1947, Aquino was ready for a political comeback. He became close to then President Manuel Roxas. However, Roxas could not receive him openly as US Secretary of the Interior Harold Ickes had warned that the war-ravaged country could not expect material aid from the United States if the so-called Japanese "collaborators" were allowed to regain their influence in the Philippine government. And Roxas needed rehabilitation money very badly. On the evening of December 20, 1947, the title fight between Manuel Ortiz, the world bantamweight boxing champion from Mexico, and Tirso del Rosario, the Filipino challenger from Tarlac was held at the Rizal Memorial Stadium in Manila. Aquino was among the spectators. When Del Rosario got knocked down in the fourth round, he suddenly jumped up. He had suffered a heart attack. Del Rosario lost the fight, and Aquino died of cardiac arrest. Benigno Aquino Sr. was buried in Concepcion, Tarlac. Delos Reyes, Cornelio, editor. Who is Who in the Philippines 1930-1931. Section One. Manila: Eyco Press, 1930. Galang, Zoilo M. Encyclopedia of the Philippines Volume 9. Manila: P. Vera & Sons Company, 1936. Gwekoh, Sol H. “Hall of Fame: B.S. Aquino- A fighter for principles.” The Manila Times. (September 3, 1966). NHI Files, unpaged. Joaquin, Nick. The Aquinos of Tarlac. Metro Manila: Solar Publishing Corporation,1983. Weisblatt, Franz, editor. Who's Who in the Philippines, 1940-41. Manila: The Author, 1940. p. 10.